When I unboxed my first Schoenhut toy piano a few years, I was surprised and delighted to find a small, colorful booklet included with it entitled “Play By Color.” This booklet contained around a dozen simple tunes (“Twinkle, Twinkle, Little Star,” “Happy Birthday,” etc.) 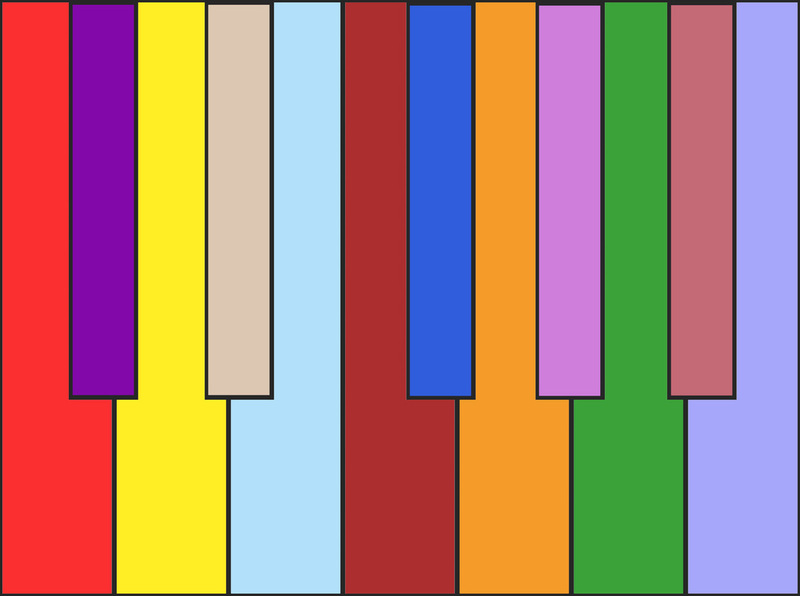 with vibrant blocks of color superimposed over each note. A corresponding color-strip made of heavy paper was included as well, which could be placed above the keys of the toy piano to act as a kind of decoder—a ‘green’ note on the page indicated to play the key with the ‘green’ color above it. As a pianist and researcher, I am fascinated by the semiotic frameworks and operations necessary for the visual communication of musical ideas. While the color-system employed by Schoenhut undoubtedly works for picking out the notes of simple melodies, the same methodology applied to complex repertoire convolutes rather than clarifies most facets of a work's musical information. Certain relationships between data are magnified, while many others are erased, shrouded, or otherwise obscured. Ultimately, these visual works are not intended to have any utility as alternative notations for pre-existing musical ideas. Instead, these pieces explore facets of musical notation strictly on the visual-cognitive level. They are echoes and imprints, departing from and returning again to unsounding structures, existing in the liminal space between form and possibility.